When you are just starting up, you need to get your business name on the web as rapidly as possible. Often due to budget constraints, many start up companies embark on DIY web design projects, creating websites that look amateurish, are difficult to use and impossible to find. Don't be tempted to go that route, because it is simply a waste of your time. If you use a DIY Site Builder or Site Studio, you will be stuck with inflexible design that you won't be able to upgrade or convert (both being proprietary software), so at some point you'll have to redo your website anyway. 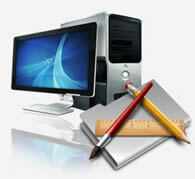 We offer Site Builder with our hosting packages, but recommend it only for personal site development. With the options we offer, you can have a professionally designed website, even on a shoe-string budget. You can start with a Web Card and then upgrade to a larger site, as your business grows. LANDING PAGE - A landing page is an important part of your online marketing strategy. It is a single, custom-designed web page that has specific goal in mind - to compel the visitors to give their email address in return for a free information, a product or some other benefit. Sometimes Landing Pages act as single product Sales Pages..
SMALL ECOMMERCE WEBSITE (Online Store) - This website design has the same functionality as a SMALL BUSINESS WEBSITE, plus it includes a product database, a PayPal Shopping and a Content Management System, so you can maintain your own price list and product inventory. According to Royal Pingdom, an authority blog that reports internet-related statistics, the number of websites on the internet at the end of December 2009, exceeded 234 million, with 47 million added in 2009. Unfortunately only a small percentage of those websites generate any traffic and sales. If you would like your website to be among those few that make it to the top of Google search results, you need to plan it well and have a good strategy for promoting it. Unfortunately, some business owners forget about this objective and get seduced by web design companies that have "sleek" graphics and "moving objects" on their site. As a result they end up with an impressive site that doesn't get any visitors. Good content, few well-placed graphics, plus a video and a blog, this is all most websites need to achieve success, apart of course from some smart promotion. If you plan it well, your website can be your best sales person, working for you 24/7, 365 days a year, and the expense to get it right will be negligible in comparison to its earning potential. Let us design your business website and you will not look back. All our websites are search engine optimized and some of them appeared on the first pages of Google within a month of being created. Need more proof? Have a look at our Web Design Portfolio! To order a website, simply click on the blue button below. If you are looking for a comprehensive Online Marketing Solution that offers you, apart from the web design, everything you need to market your business successfully online, please go to our Packages page.